Tassels and pom poms and fringe galore! 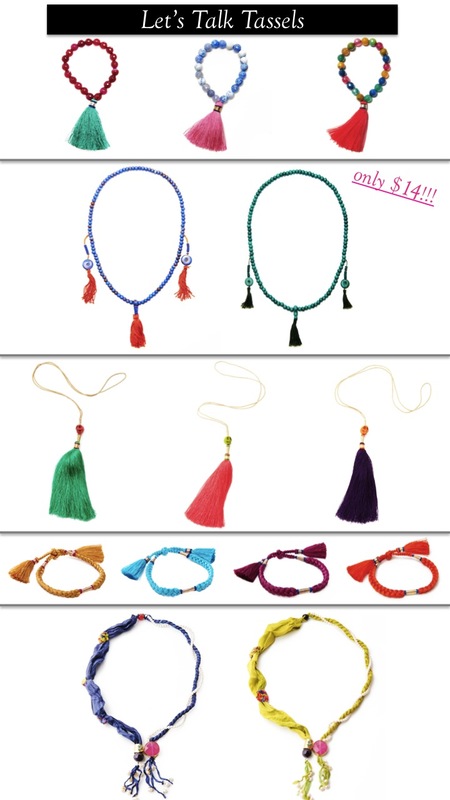 How fabulous are these tassel adorned necklaces and bracelets?! They have a festive flair without being too over the top and would make perfect gifts. What's even better is they all cost under $100 (thank you very much, L-Atitude)! Try layering long tassel necklaces over a white tee and jeans for an instant update or mixing up your usual arm candy with a stack of beaded tassel bracelets. A girl I work with was rocking the most fabulous bracelet with a tassel the other day. I wasn't sure I'd like this trend, but I totally do after seeing a piece in person! i've been seeing the tassel / layered necklace thing everywhere these days! i love the look of wearing a few different necklaces in different lengths/colours ! Okay, I think you've convinced me. I'm loving all of these; thanks for sharing! hello beautiful tassels! Love those long necklaces! I adore the tassel trend - and I really want a long drop necklace with a tassel. The HONORINE necklace in green is a must. I love the simplicity of a gold tassel so I am super happy about this trend!